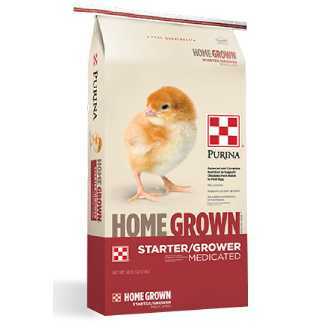 Purina® Home GrownTM Starter/Grower Medicated chicken feed provides complete, consistent nutrition for raising laying chicks from hatch to laying age (18-20 weeks). This complete feed comes with 18% protein and quality nutrients to support proper growth. Medicated with amprolium (not an antibiotic) to aid in the prevention of coccidiosis.